New Year's Sale! 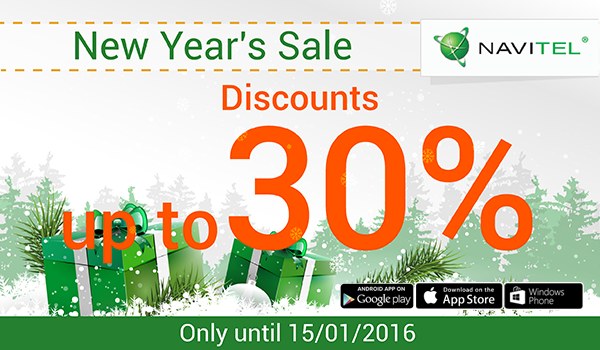 Only until 15 January 2016! Discounts up to 30% on any NAVITEL® product purchased online in Google Play, App Store or Windows Phone Store. Just on the eve of the holidays, NAVITEL® announces the “New Year’s Sale”. Only until 15 January 2016 the users of iPhone/iPad and devices on the basis of Android and Windows Phone operation systems have a wonderful opportunity to purchase an electronic key on any map package with a discount up to 30%! The electronic license with the discount can be purchased in Google Play, App Store, Windows Phone Store. It is also possible to purchase it directly from the application (Menu > My Navitel > Purchase Maps). Make a New Year gift for yourself and your loved ones!